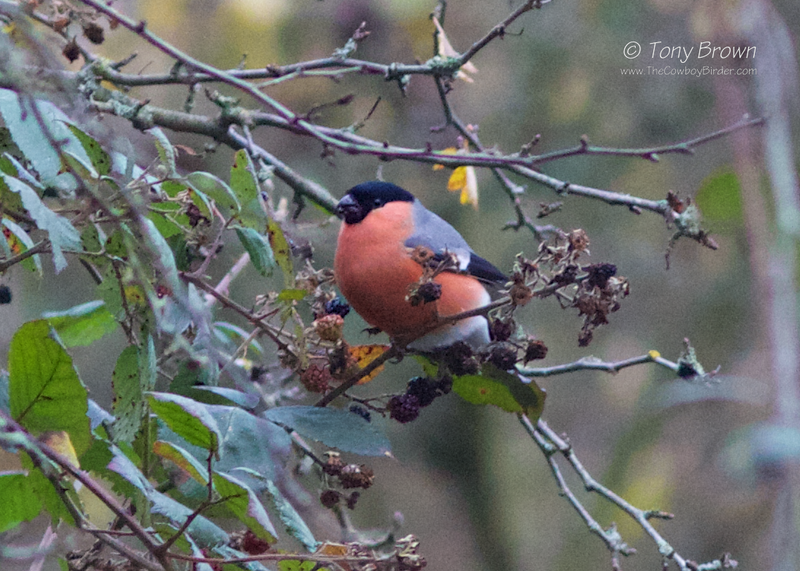 Bullfinches on the patch are scarce, I've only ever seen four birds in about seven years. So when a pair were being seen regularly in and around Long Wood I was more than keen to catch up with them - especially as this would be a welcome addition to the year list, but after several visits to their favoured area I was having no luck - but this all changed on Saturday morning. After a big circuit of the Flats in which the only highlight was the discovery of a Stonechat in the grassland near the Cat & Dog pond - a favoured area for wintering birds in previous years. I passed through Long Wood again after drawing a blank earlier in the morning, and as I reached the Reggae Tree (still one of the best named locations on the patch) I could hear a couple of softly calling Bullfinches, but knowing how easily spooked they can be, I slowly edged closer towards where the calls were coming from and after a few minutes, there, feeding on the last of the blackberries was this really smart male Bullfinch. I just managed to fire off a couple of record shots before the bird flew off calling, but to my surprise there wasn't just two birds, there were in fact four birds! Two of which looked as they were 1st-winter birds - so in a matter of minutes I had managed to double the amount of Bullfinches I had ever seen on the patch. This winter Bullfinch is being seen in record numbers nationally and are following a similar pattern/route as Hawfinch with many arriving from the continent pushed our direction in search of food after what is believed to be a combination of a poor Beech Mast Autumn and crop failures across Northern Europe. We could also be in for a bumper winter for Brambling with reports of big numbers (10's of thousands) just across the north sea in Scandinavia. Most of the sightings of Brambling at Wanstead are brief flyovers of a single calling bird, so it would be good to get few of these colourful finches on the deck. 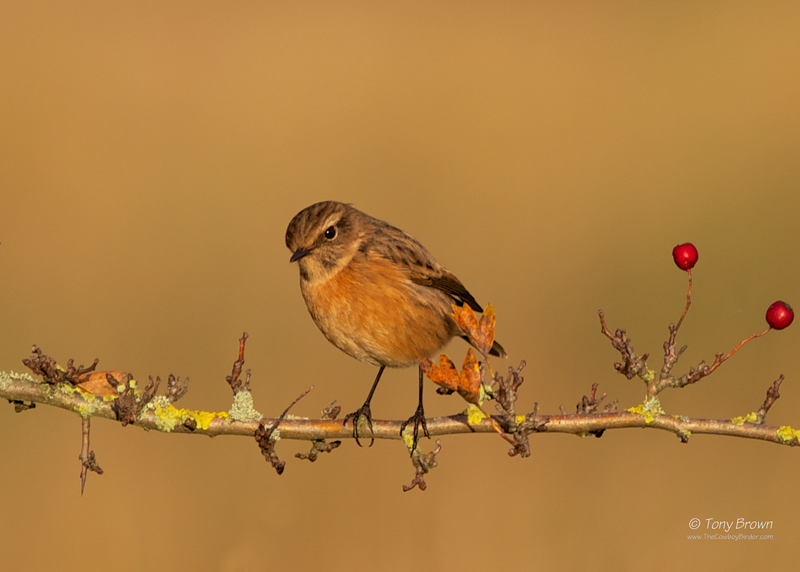 Saturday mornings Stonechat happily posed for a photo or two, in what was the briefest of Winter sunshine windows before the rain arrived. Apologies for the terrible title pun but I couldn't help myself. 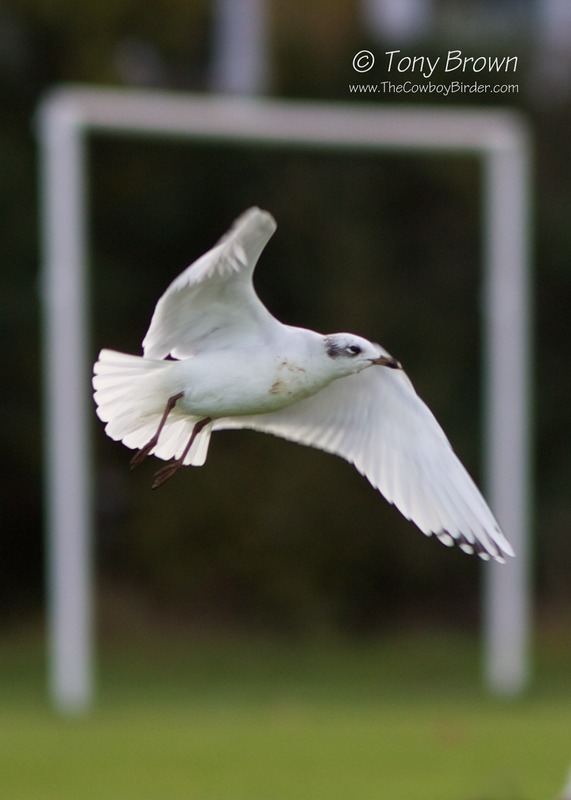 This 2nd-winter Mediterranean Gull was a nice find amongst the increasing numbers of Common Gulls roosting on the football pitches on Wanstead Flats, and was the only highlight of an unremarkable Sunday morning jaunt around the patch. The finch movement has now virtually dried-up and the arrival of winter thrushes has also abated with only a handful of Redwings and Fieldfares seen today. The only other birds of note were 5 Pochard (4m, 1f) on Jubilee Pond, and were clearly fresh arrivals from the Continent. Med Gull - Back of the net! So after scoring (another bad pun) with the Med Gull I headed to Bush Wood in search of a couple of elusive year ticks, and it wasn't long before Treecreeper (104) soon fell, but in the short search for Firecrest I drew a blank...It looks as if i'm going to have to come back before the year is out and give that one another go.